Size is probably the most important purchasing variable and should be the first thing to decide before researching the various kinds of refrigerators that fit the mold. Decide on size, then proceed to style, features and colors. The reason for this is that the different styles of fridges also have certain characteristic sizes associated with them. First, decide how much storage you need. This is the most important piece of the equation since your fridge needs to be large enough to handle your family and needs. If that requirement is not met, your going to get very tired of the fridge. 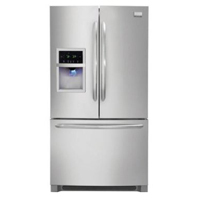 Storage availability for standard size refrigerators is measured in cubic feet and generally runs between 18 cu. ft. for a smaller fridge and 28 cu. ft. for a large one. Do not be surprised if the actual real capacity differs from the manufacturer stated amount. In some testing we measured between 20% to 30% deficiency in the actual usable space. You can pretty much expect the same deficiency across manufacturers for instance a 25.6 cu. Ft side by side refrigerator may have 20 cu. Ft of actual storage but this will be the same across all 25.6 cu. Ft side by side fridges. Counter Depth Refrigerators are especially sensitive to depth requirement since they are supposed to fit flush with the counters.